Given that the second round of Sainsbury’s Great British Beer Hunt 2013 finishes today, it might have made sense to write about it sooner. But it’s been a funny – and busy – few weeks round our way, and I’ve just not quite found the time to do so. What you gonna do? 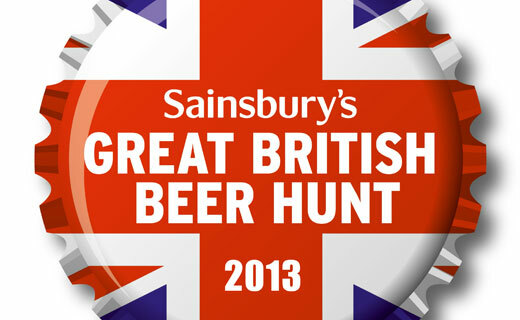 For the uninitiated, the GBBH is a national competition, organised by Sainsbury’s, to find the best new beers the country has to offer. 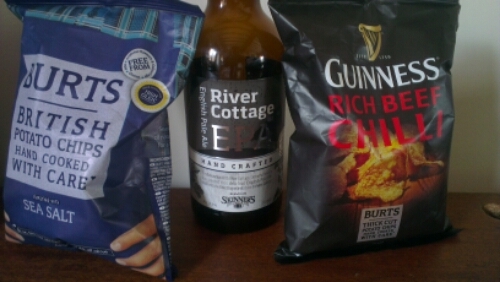 Starting with regional heats, now fewer than 156 beers are whittled down to just two – a winner and runner-up – whose prize is to go on sale for a minimum period in Sainsbury’s stores across the country. Now in its third year, the competition has unearthed a few gems such as Caesar Augustus by Williams Bros. and last year’s winner, Bateman’s Mocha (although the last couple of bottles I’ve had of that have been oddly diaappointing). Each year that the competition has been running, my brother-in-law and I have joined in at the second stage of the competition, where the shortlisted beers go on sale for a limited period, and the best-sellers make it through to the final, by buying and sampling at least one bottle of each beer. This year, we were joined by our friend Andrew, who happened to be visiting for the weekend, meaning that we were able to sample all 20 beers in a single evening, rather than 2 or 3 as in years past. 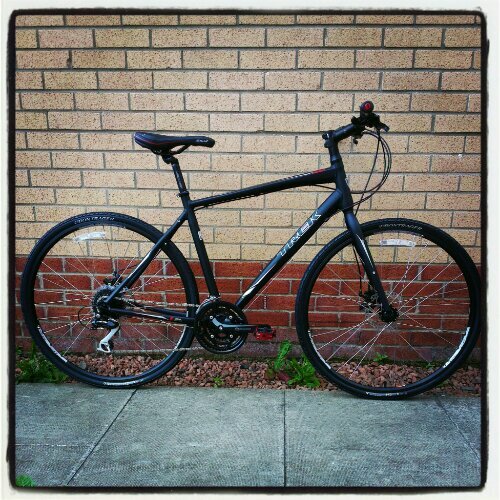 If you happened to be reading my twitter stream last Saturday night, you’ll already know how we got on. If not, well I’m not going to repeat the beer-by-beer account here, but it’s out there if you really want it. Instead I’m going to summarise my thoughts on this year’s selection, which, unfortunately, I found a bit disappointing. Don’t get me wrong, for the most part the beers on offer were tasty enough, and with a couple of exceptions (Barney’s Brew by Hilden and Serendipity by Bird’s Brewery) I’d happily drink any of them again. My problem, though, was that they were all too similar. In previous years there have been a wide range of beer styles on offer, but this year seemed to be mostly golden ale after golden ale after golden ale, and it all got a bit monotonous very quickly. No surprise then, that my top 3 were ones that broke the mould. Williams Bros‘ Gonny No Brew That was the tastiest of the golden ales, and definitely the pick of the Scottish beers. 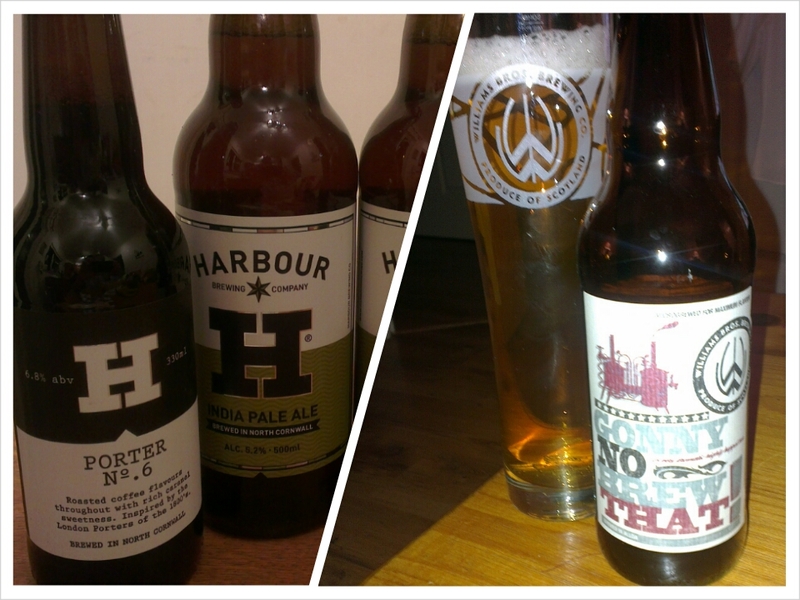 My other top beers were both from Harbour Brewing Co., a relatively new brewery in Cornwall, but one I’ll be keeping an eye on. Porter No.6 was sweet with a lot of coffee and dark chocolate flavour to it, while I found their IPA to well balanced and definitely more flavoursome than most of the beers on offer. 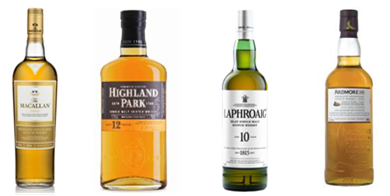 I’m not sure I could pick a winner out of those three – that’s for the judges to decide on Friday, assuming they all make the final in London – but any one of them would be a worthy winner. Sainsbury’s seem to tweak the format of the competition each year, and while I doubt there’s much they can do to increase the variety of styles (the beers making it to the second round are selected by the public at a series of tastings) one thing I would like to see them do is limit the number of entries each brewery can have. This year, 5 breweries were responsible for 11 of the 20 beers on offer, which doesn’t exactly promote diversity. But other than a few minor quibbles, I think Sainsbury’s are once again to be applauded for this annual celebration of Great British Beer. I look forward to hearing who the overall winners are in Friday’s final. And who knows, maybe next year I’ll make it to the regional heats and be able to shape what makes it through to the second round. Of course, despite my earlier moans, I reserve the right to vote for golden ales. 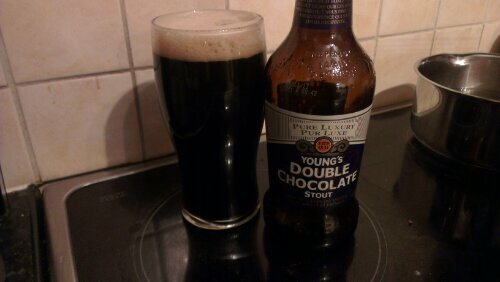 I might have mentioned before that I’m finding my beer drinking tastes turning darker and darker. Maybe it’s the cold weather – lighter, hoppier beers seem more suited to summer somehow – or maybe it’s because it’s just that I’ve historically not drunk many dark beers, so they seem all shiny and new to me. It might even just be that there are more of them available – I read this article a while back, about how every small brewery worth its salt is clamouring to get into a growing market for stouts and porters, which means I’m not alone in my newly developed taste for the black(er) stuff. Whatever it is, last weekend I found myself a trio of beers darker than I would have drunk a year or so ago. I think I’ve mentioned before that I’m a big fan of Williams Bros, so I expected this one to hit the spot. And it did, with treacle toffee very much the dominant flavour. That said, it wasn’t too sweet, and actually could have been a bit sweeter to be honest. A good beer, although not my favourite in the Williams Bros range. It’s taken me a while to get round to trying this which is surprising given how highly my brother-in-law has spoken of it. I’m glad to say it lived up to the hype, with big chocolate/coffee flavours and a lovely creamy feel to it. I think Bateman’s Mocha is probably still my top coffee/chocolate beer to date, but this comes a close second. 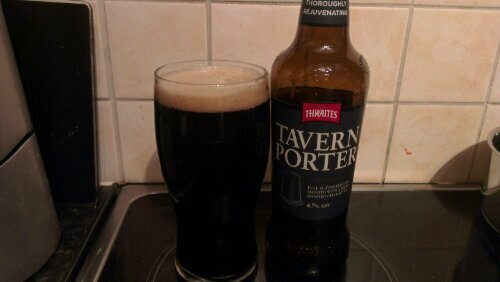 The blurb on the label about Elizabethan taverns should, perhaps, have made me suspicious – the porter style of beer isn’t documented until the 18th century, long after Good Queen Bess’s time – but I didn’t think about that until later. Historical inaccuracies aside, the beer wasn’t that exciting. Not unpleasant, but nothing memorable either, and not one I’d rush to drink again. It’s not often that I get to try the same beer on tap and bottled, it’s usually one or the other, and mostly the latter, although with the recent opening of Munro’s not far from work that balance might change a little. Tonight was something of a rarity then, as I cracked open a bottle of Innis & Gunn Original, a beer I first tasted on draught back in October, albeit that was a sip from Gem’s glass. On that occasion I remember really enjoying it, so I was looking forward to tonight’s tipple. It would be wrong to say I was disappointed, but the beer didn’t quite live up to the memory. For a start off it didn’t pour well – I like my beer to have a decent head, and although that’s not always easy to do from a bottle, it is usually achievable. 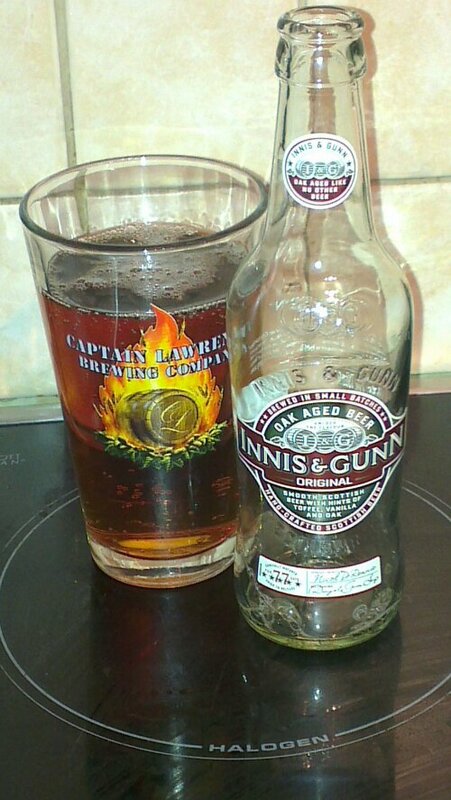 The Innis & Gunn poured more like a soft drink, with an initial fizzy head that quickly disappeared. It did at least retain some carbonation to the end, though, rather than going completely flat. That was about the only negative though, and it may be have been down to my pouring and/or choice of glass – that’s something I need to learn a bit more about. Taste wise, it definitely lived up to expectations. Aged in oak casks for 77 days, the beer has a complex malty flavour with more than a hint of vanilla. There is also a spirity taste in there that reminded me of rum. Presumably that’s down to the higher than average 6.6% alcohol content. 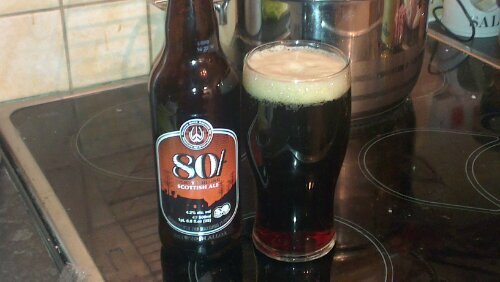 Overall, it was an enjoyable beer, but not quite as good as last time round. I’ll definitely be looking for this one again, but will probably stick to draught in future.